If sipping a great glass of wine while noshing on some excellent cheese sounds like a great idea, then why not consider including a visit to one of these nearby wineries on your next holiday to Byron Bay? Byron Bay is part of the Northern Rivers wine region and there are several excellent wineries within an hour’s drive. So if you enjoy great Australian wine, then make a note to add a day trip into your Byron Bay holiday plans. You’ll be glad you did! Located in Whian Whian, which about is about an hour from Byron Bay, Imogen’s Farm sells its wine at the Byron Bay Farmers Market every Thursday morning. It also is stocked at Beach Hotel in Byron Bay and the Park Motel in Suffolk Park. So take note, if you like any of the farm’s wine, then buy a bottle to take home or enjoy during your Byron Bay holiday. This family farm started in memory of a sister and daughter who passed away in 1998. The vineyard came from Imogen’s parents, Douglas and Christine Kesteven, who previously ran The Deli Byron in Byron Bay. In order to visit this winery, you’ll need to make arrangements ahead of time, by contacting the winery by phone (02 6689 5839) or email to wine@imogensfarm.com. Flood Reserve, which has been producing wine since 1997, is open on the weekend for visitors, but you must schedule the appointment ahead of time. It will take a little over an hour to drive to Tatham where Flood Reserve is located, so be sure to phone (02 66 63 1205) or email to sales@floodreserve.com to schedule your visit to this Byron Bay area winery. Brian Mull, the owner of Flood Reserve, uses traditional methods, many of them manually, and does not use artificial tannins nor does he filter his wine. He produces five Australian wines, two white and three red, all are available for $12 or less per bottle. In the white wine category, Flood Reserve has a chardonnay and a verdelho, and then in the reds, the winery produces a cabernet sauvignon, a wyarie red and a chambourcin. The winery offers wine tastings Wednesday to Sunday between 11 am and 4 pm as well as having a café on the property. Located about an hour north of Byron Bay in Carool, this winery has offers a great reason to take a day trip here. Tastings cost $3 per person, and you may taste up to eight wines. Using the international standard wine glass for tasting, the XL5, you can swirl, sip and enjoy every last drop. Group bookings are allowed. In addition, the cost for tasting will be returned if you get a bottle to bring home. However, it does not apply to tour groups. The winery offers three different types of tours on different days. The most economical wine tour is offered for $10 per person. It includes a tasting of up to 10 wines, a brief explanation of each wine, as well as a chance to look at the winery and the equipment and take a walk in the vineyard. It lasts about 60 minutes. An upgrade from that option includes a longer time of 90 minutes to do all of the above, plus a souvenir Ilnam Estate wine tasting glass. This tour costs $60 per person. Make sure to book your tours by phone (07 5590 7703) or email to info@ilnam.com.au. The winery’s café is open Wednesday to Sunday for lunch and morning or afternoon tea. There are excellent views of both the ocean and valley from the café so enjoy some good food and the great Australian wines in the beautiful setting. Book your Byron Bay holiday at Broken Head! 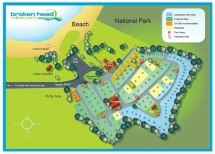 Broken Head Holiday Park makes the perfect home base for your Byron Bay holiday and to visit these wineries. We’re in close proximity to the centre of Byron Bay, but offer more peace and quiet. The various types of accommodation we have will work for whatever kind of holiday you’re looking for and provide an economical price for your stay. Come visit Byron Bay and pick one of the above wineries to check out so you can try some excellent Australian wines. Don’t forget to check out Byron Bay’s newest and best stocked wine shop the Beach Bottle in Bay Street too if you’re a wine lover!